In September 2015, we welcomed Sarah Douglas to our Board of Directors. 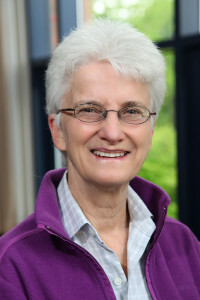 Sarah is a Professor Emerita of Computer and Information Science at the University of Oregon. She has done pioneering work in human-computer interaction and the development of effective support for scientific discovery through bioinformatics. What brought you to Breast Cancer Action? My personal experience with breast cancer began when a former partner died from the disease in 1996 and a younger sister was diagnosed with breast cancer in 2002 when she was 54 years old. In 2007, I joined the National Institute of Health (NIH) Sister Study to contribute to the on-going research effort to understand environmental and genetic risk factors of breast cancer. Then in 2013, at age 69, I was diagnosed with breast cancer. When I talked to my sister about my diagnosis, the first thing she said was, “Remember cancer treatment is big business.” Later I became very aware of the politics of breast cancer, particularly the social injustice around healthcare delivery and the lack of reliable evidence-based medical information. Breast Cancer Action addresses both issues and also speaks out against the environmental chemicals that contribute to the breast cancer epidemic, which is an issue I’m especially concerned about. My sister and I grew up on Navy bases in Bermuda and the Philippines, where DDT was sprayed every week from a truck. The truck would pump the chemical into the air as a fine spray. We would run through the mist for fun as we played, not knowing that chemicals were coating our bodies and being absorbed into our skin. Though we’ll never know for sure, I strongly believe that my sister and I developed our breast cancer because of this exposure to DDT. I now live in Oregon, but am still faced with regular exposure to chemicals in the environment. The timber industry regularly sprays herbicides that contain known endocrine disruptors and carcinogens on the newly planted forests in the state. It’s no wonder that where this spraying occurs, breast cancer rates are higher, which is the case for Oregon and Washington state. Why did you decide you wanted to join Breast Cancer Action’s board of directors? I retired a few years ago and was looking for an opportunity to share my skills and experience. I donated money to Breast Cancer Action for many years, but I wanted to give more than money. I wanted to be really engaged in political activism around breast cancer. Breast Cancer Action had impressed me for years with our Think Before You Pink® campaign and our participation (and win) in the Supreme Court case against Myriad’s patenting of the BRCA genes. What made you decide to give to Breast Cancer Action? I love this “bad girls” organization and its commitment to truth-telling and health justice with a focus on women. I first began by giving small annual donations. Then in 2014, I started giving a larger amount of money from my retirement IRA. What made you decide to give to Breast Cancer Action through your IRA? The IRS requires that all people who have an IRA must withdraw a minimum percentage when they reach 70 1/2 years old. This is called a Required Minimum Distribution (RMD). When I reached that age, I realized that I didn’t need all the money and instead decided to transfer it directly to Breast Cancer Action. This form of giving from your IRA is called a Qualified Charitable Distribution (QCD). And, because you can only give this money directly to a charitable 501(c)(3) organization, for me, Breast Cancer Action was an obvious choice. What advice would you give to someone who is thinking about donating to Breast Cancer Action and specifically giving to the organization through their IRA? Giving to Breast Cancer Action is a great way to safeguard what makes our organization unique and effective. And giving directly through a QCD is easy and uncomplicated. The IRA custodian writes a check directly to Breast Cancer Action and neither you nor Breast Cancer Action pays the taxes that would normally be due because the money is going to a charitable 501(c)(3) organization. Everyone benefits. If you have questions about how a QCD can be used to satisfy your required withdrawal, you can check with your accounting or tax professionals or contact your IRA custodian to help answer your questions. What are other ways you plan to give to Breast Cancer Action? Another way I plan to invest in Breast Cancer Action’s breast cancer advocacy is through Planned Giving. In other words, I plan to include them in my estate plans through the Elenore Pred Legacy Circle. I’ve named Breast Cancer Action as a beneficiary of my IRA and other retirement funds. Of course, this is not an immediate donation, but it’s how I plan to leave my personal legacy of taking action to end the epidemic once and for all. If this is a way to give that feels like a good option for you, it is important to realize that the named beneficiary does not have to be a person. It can be a charitable organization (501(c)(3)). And, the distribution is excluded from estate taxes in this case. I live in Oregon, which has an estate tax in addition to the Federal estate tax, unlike most other states, so be sure to look into the process in your own state.